United Kingdom-based luxury vinyl flooring company, Karndean Designflooring, contributed to the transformation of a former chocolate factory into a residential and nursing care community. The new building is called The Chocolate Works Care Village and includes a two-storey market square with restaurants, peace gardens, a spa, walkways, shopfronts and many other facilities. 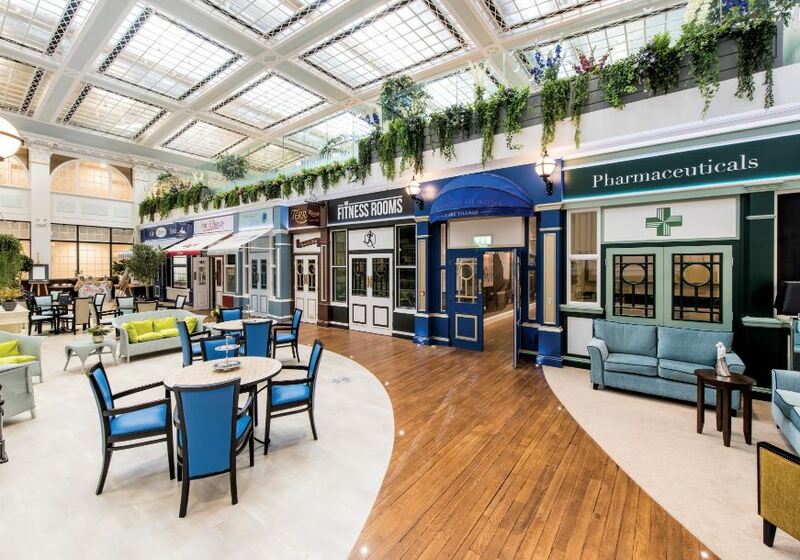 Springfield Healthcare Group specified Karndean’s Opus Terra for the centrepiece of the building, which was formerly the headquarters of the world-renowned Terry’s of York Chocolate Factory. The marketplace in the middle of The Chocolate Works Care Village lies beneath a two-story atrium with a glass roof, featuring a café, shops, hairdressers, and its own pub. Opus Terra was installed in the bustling marketplace alongside some of the original wooden planks from the factory, and Knight Tile Mid Brushed Oak was installed in the corridor that houses the history of Terry’s. Mark Gibbons, Managing Director of M.G. Flooring, contractors to the project, says the warm, earthy tones of Opus Terra were “an ideal fit for the design specification”. “The product looks great in the vast space and it’s very warm and welcoming which the residents will appreciate. The zoning effect will help the visually impaired and distinguish one key area from another. The square cut of this product makes it easy for us to handle, something you don’t get with all vinyl products, and gives the room a modern feeling. It’s also great with underfloor heating and has a R10 slip resistance rating which is just what you need when providing for the elderly,” said Mark. Knight Tile Mid Brushed Oak was chosen for the nostalgic corridor because it had the characteristics of the original floor but with the durability of vinyl. The flooring has a realistic brushed texture and traditional grain pattern, but is able to withstand heavy foot traffic as well as traffic from moving equipment and wheelchairs. “Karndean Designflooring have an excellent reputation for serviceability and durability and they certainly lived up to our expectations. We love the flooring and it’s so easy to maintain and keep clean,” said General Manager for Springfield Healthcare Group, Sarah Paskett. Full thanks and acknowledgement are given to http://www.tomorrowscontractfloors.com/ and www.karndean.com for the information contained in this article.